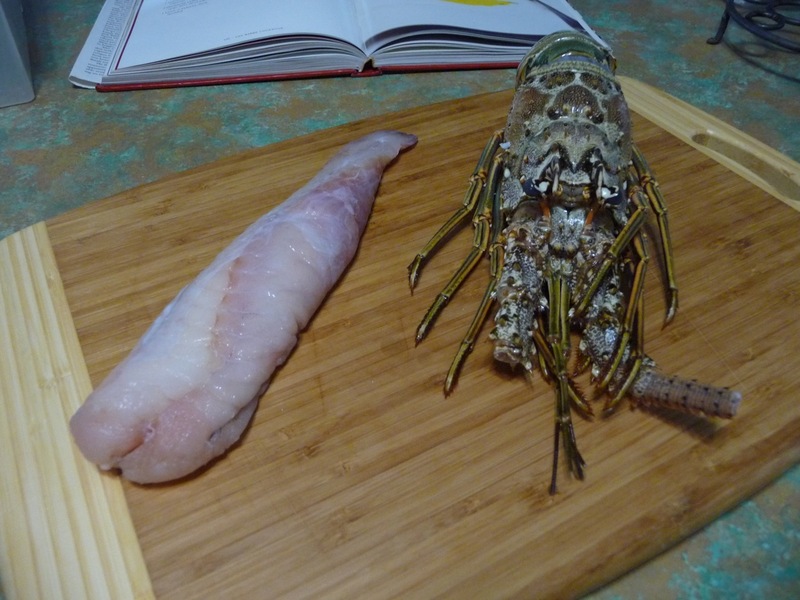 They call monkfish "poor man's lobster." It costs $15 a pound. I don't know. I never used to see monkfish in the stores around here. Now its almost always in the stores around here. So I guess the word is out. I hope that doesn't mean it will be extinct soon. But if you've ever seen a monkfish, you have to wonder who the first person to think that eating it was a good idea was. It's a scary looking creature. Sure, when you see it in the store, its just a mostly white piece of tail meat. There are some blue and red striations on the meat, but nothing too disconcerting. (That's it on the left above,) But if you saw the fish with the head on it, you'd presume it was a prop from a horror movie. A particularly frightening one. It doesn't come from around here. My fish store says they get their's from Oregon. This was a dish I was looking forward to, and since it is in all the stores lately, I decided to knock it out. Not a hard one. The texture of the fish makes total sense for a picatta, which is a preparation I'm a big fan of for standard stuff like chicken and pork. 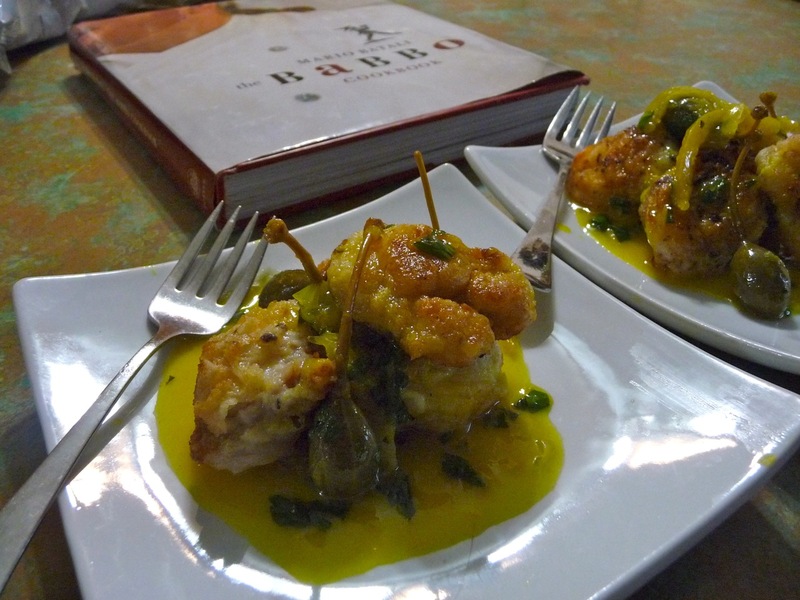 The pieces of fish get pan fried, and the lemon and wine gets pumped up with preserved lemon. Big caperberries dot the plate. Here's the recipe. When I make typical picatta, it's usually a pasta dish. While I didn't want to just plate this on top of a bowl of pasta -- though I'm sure that would have been quite good -- I wanted to find something that would go with this dish. 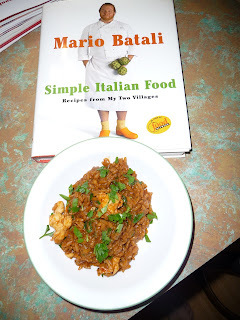 I looked through the Babbo book for a pasta or a contorni to go with it, and didn't see anything that made sense with the monkfish. Since I wanted it to go with something called "poor man's lobster," I thought this was perfect. Then it got better. 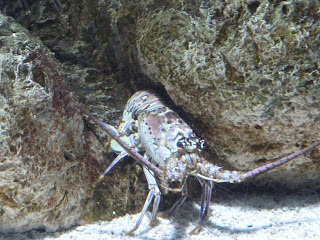 In the first book, Mario talks about his preference for spiny lobsters, like those from the warm waters around Italy in the Mediterranean. Guess what kind of lobsters come out of the warm waters around Florida. And guess what season just started. That one above? It's at the Florida Aquarium. Total coincidence I was just there. And the recipe was a breeze. You boil the lobsters, then use the water they were cooked in to cook the rice. Super simple, and super luxe. Well, that was a great idea. I should look around to see if there are any other cookbooks in the house with fabulous recipes I haven't tried yet. Up next: Not sure yet.